Day 4 - Saturday: I decided early in the morning that I couldn't let an opportunity to ride some really great mountain bike trails go to waste. This time I drove over to the trailhead and I was not disappointed. It was two hours of sheer bliss and I carved through the woods on some pretty awesome single track. If we only had a few more days here I would have been in total heaven. It was a great work out and I was thoroughly exhausted. It's been a while since I had a chance to ride off-road, most of my riding the last 6 months have been on the streets of Eastlake, Oh where I take a 1 hour ride each day during work to relieve a little stress. As soon as I got back to the RV Michelle asked if we where gong hiking. Sure I said, after a shower and an hour in my outdoor reclining chair. Well the hour turned in two, but I finally felt rested up and we grabbed our Kelty hiking poles. We decided to hike the Ore Pit trail which you can access from the campground in a number of spots. 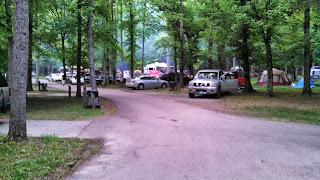 We started by the check in hut, but you can also access it from the rear of the campground or anyone one of the tent sites. The weather was amazing, a light breeze, partly cloudy and temps in the low 80's with low humidity. The terrain is hilly, but not to steep. The hike was only about 3.5 miles with sections of the Wildcat trail thrown in. We didn't have any background on the Ore Pits, so although we saw some small pits it was hard to tell what and when activity actually occurred here. Our friends Joe and Shelly who have traveled with us on many summer RV trips planned to arrive around 5 to join us for the remainder of the adventure. Somehow they managed to shave an hour off their 10 hour trip and pull in early. Once they wedged their 43 ft Allegro Bus between the trees and parked cars, we got things ready to cook dinner over the fire. It seemed everyone else decided to come in on Saturday as well and the campground at this point was filled with smokey fires, screaming kids and a ton of barking dogs. We sat around catching up on the past few days adventures and planned out tomorrows itinerary. Since we would be pulling out at 7 am the following morning, we called it a night around 9 and I was in bedding and sleeping shortly there after. It was a good day to be camping.